“Voiturette” is basically French for “small car” or “light car” (no, that’s not a direct translation). The term was used widely and applied to many pre-war automobiles coming from France. Amilcar started producing cyclecars in 1921 and before long that had sturdier equipment tearing it up on racetracks in Europe. The C6 was introduced at the Paris Auto Salon in October of 1926. It featured a twin-cam straight six with a Roots-type supercharger that made over 60 horsepower. Because Amilcar was not a giant operation like some of their competitors (like Salmson), their cars were somewhat more expensive (economies of scale, anyone?). This led to a price for the C6 of about 40,000 francs – which is about what you could’ve bought a Bugatti Type 37 for back in the day. 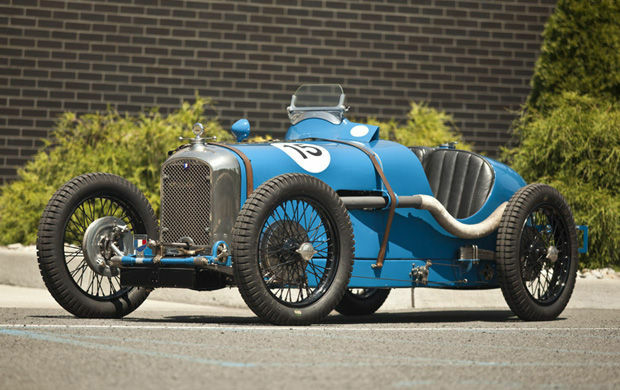 The Amilcar shares the pre-war open-wheel race car look (and the striking blue paint) with Bugatti and, while the Bugatti might win the sexiness competition, one could argue that an Amilcar is more interesting (and rarer). This car did not sell at a previous Bonhams auction within the past 12 months. It is being offered again with an pre-sale estimate of about $580,000-$680,000. For a more thorough history on this particular care, click here and for more on Bonhams in Paris, click here. This entry was posted in Uncategorized and tagged 1928, amilcar, auction, Bonhams, c6, car, classic, classic car, voiturette by classiccarweekly. Bookmark the permalink.